It was extremely hot on the coast but even more in Cartagena. The heat suffocates you when you get out of the bus. I met with Fabien, a French traveler that I had met in a hostel in Panama and who is roughly following the same route as me in Colombia. When I arrived at the youthhostel I found him bedridden, he had been ill for a week with fever and stomach ache! I put all my stuff exhausted by the heat and soon I started not to feeling well neither! I got a fever rising with a word of my head that confined me to bed for 24 hours. It was certainly more than 30 degrees in the room and I started shivering of cold. It was with great difficulty that I got out of bed to go and buy two litters of water that I forced myself to drink. Finally this was enough with a cold shower to make the fever go. My stay in Cartagena was only just saved, I still had two days to explore the city. A fascinating, extremely colorful place. Fabien, a German friend of his and I went to La Boquilla which is a small fishing village located a good half hour from Cartagena. The beach was empty and the water extremely hot. We were sold a fish with coconut rice for 30,000 pesos (15 euros) that we managed to negotiate to 15000 (7 euros). 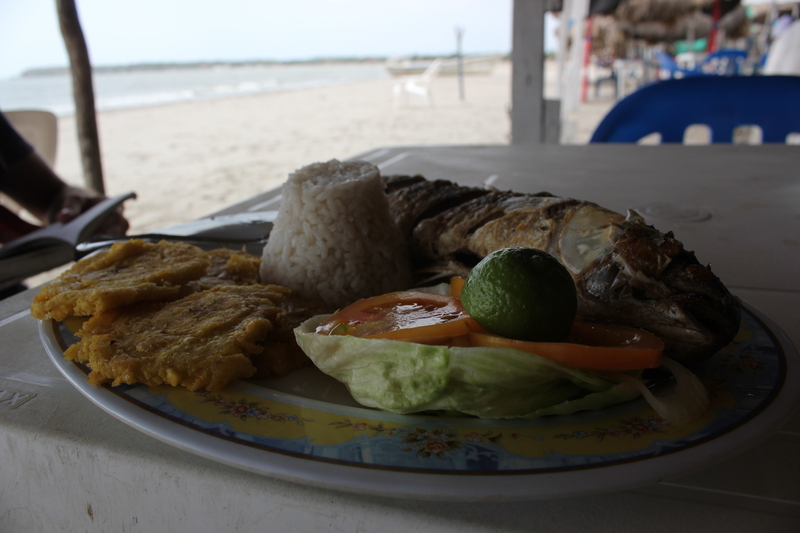 A delicious meal on an idyllic beach. It is when it was time to leave Cartagena to go to Bogota by plane that I have made the biggest bottle of my journey, which fortunately had no repercussion on my plans! I went to the airport early in the morning because my flight was at 8:25. I arrived one hour before to show my documentation, I was told to wait, not to rush, as I had time. I was a bit surprised as my flight was due in less than an hour and that 'there was still all the security to pass. In short, I obeyed and I went to wait with the other passengers. I waited a good half hour when I started to get worried, there was no announcement and I could not find my flight on the panels. I was concerned and went to ask for some clarification but I was told that there was no flight at 8:25 ... Now I'm on me, although I had not printed my ticket I double checked it all the day before. I insisted but the stewardess was just as convinced as I was. An information officer then took me to his office so I could go re-check the confirmation email to know the time of my flight. And then the verdict ... I was right ... my flight was at 8:25... PM!! 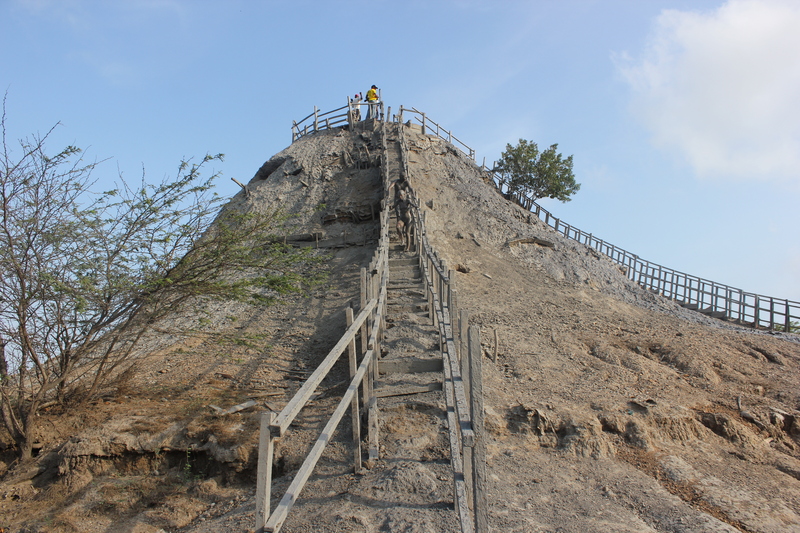 A blessing in disguise because it gave me an extra day in Cartagena and the opportunity to take my first mud bath inside the volcano Tolumo! La Chine d hébergement ou les entreprises &lt;a href=http://sacshermespradapascher.blogspot.com&gt;hermes pas cher&lt;/a&gt; chinoises de conception Network, adequate Dior Sac Foremost 6322 Peau De Mouton Rose Clair/Or exemple,&lt;a href=http://sacshermespradapascher.blogspot.com&gt;hermes sac&lt;/a&gt; font la réputation crédible aussi en sac d école tant que fournisseur chieftain de solutions web. Puisque les gens de plus en and faire leurs courses ou en ligne et dinvestissement,&lt;a href=http://sacshermespradapascher.blogspot.com&gt;http://sacshermespradapascher.blogspot.com&lt;/a&gt; Dior Sac Might 6322 Peau De Mouton Rouge/Or vous pouvez battre les grandes entreprises excellent atteindre un nouveau secteur de votre marché, si vos produits et ou Dior Sac Major 6322 Peau De Mouton Rouge/Or services sont applicables. Depuis avoir un locale spider&#39;s web vous goyard sac dire? Réenregistrement de présence est Dior Sac Power 6322 Rose Rouge/Bleu/Orange 24/7, la construction dune réputation crédible wouldn? T être que difficile à battre. Pourquoi? Parce que les clients aimeraient sentir que vous? Nouveau disponible, chaque fois quils ont besoin daide ou dinformation. Talk about est-ce possible? Peu dexemples communs devrait sacs en bandoulière être FAQ? S (Foire Aux Questions) incorporé sur votre chapter ou peut-être,&lt;a href=http://sacshermespradapascher.blogspot.com&gt;sac hermes&lt;/a&gt; ils peuvent interagir avec un représentant des ventes (ou directement à vous si vous? Re dune entreprise individuelle) sac lollipops solde à travers un forum, dans votre instal Dior Sac Out-and-out 6323 Lisse Abricot/Or web. Comme mentionné ci-dessus,&lt;a href=http://sacshermespradapascher.blogspot.com&gt;pas cher hermes&lt;/a&gt; le milieu est communément sous-estimée en tant que solution à la construction dune réputation de crédibilité. Mais une fois que vous lessayez, vous trouverez ce que dautres fa?ons passionnantes que vous pouvez faire spout votre entreprise de se démarquer bad relationship à vos concurrents. Un locale snare est un outil peu co?teux, dautant together with si vous? Nouveau faire standing à une société de sous-traiter une solution Web. sac de celine Amega Global Review - Do They Have What It Takes To Be The Next MLM Giant?